It's an all-new Hazeldale Elementary School that greeted K-5 students on the first day of school. Families gathered Monday at the entrance of the newly rebuilt Hazeldale elementary school for the K-5 students' first day of school. "It's fun to have everyone home," said Angela Tran, principal of Hazeldale. Chinh Pham, parent of fourth-grader Matthew Soliga, was happy to return to a location closer to home, making Matthew's bus ride to school shorter. Hazeldale students have been housed temporarily at Timberland Middle School during the construction. Amira Santoya, a second-grader, had her commute cut down to just crossing the street with her mother, Vicky Santoya. "I'm excited to see the new school and all the new activities it can have," Vicky said. Some of the school's new features include: steel beam reinforcements to protect against earthquakes; solar panels of the roof; water drainage system that leads to vegetation in the courtyard of the school; SMARTE turf (a playground-surfacing alternative); all new Mac computers in the library; and classrooms equipped with Chromebooks and iPads for students. "It's not like our days," said Zeena Aeria, grandmother to a third-grader at the school, about the technological advances incorporated into her grandson's curriculum. No matter the nuance of the school's building, the staff remains the same and Aeria was comforted by the fact that her grandson will start the school year with the same teacher her 21-year-old grandson had when he attended Hazeldale. Although all the classrooms are finished and ready to be occupied, construction crews are still on site to finish up the sports field on the southeast end of the school property. 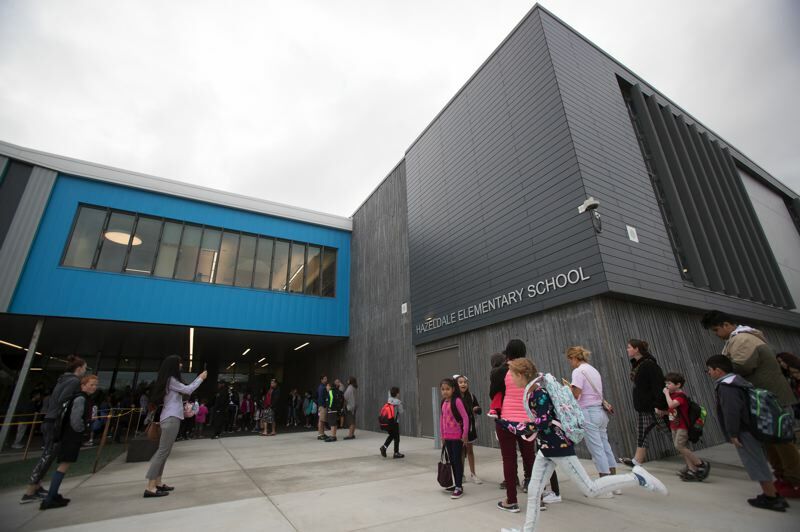 Hazeldale is the second of four schools to be rebuilt as part of the Beaverton School District's $680 million construction bond approved by voters in 2014.